Once you've completed your profile and configured your account settings, it's time to join some groups. Let's do it. On Honey, every post is shared within in a group. You can think of a group as a simple tagging or filing system that helps keep everything on Honey nicely organized. Click the groups icon in your left-hand navigation menu, it's the one with four small rectangles. Then, browse your groups and click Join on those that are relevant or interesting to you. You'll notice that some are marked as Required, which means your Honey admins require all users to be a member. Getting to know your feeds. Your feed, which you can visit by clicking the home icon in your lefthand navigation menu, is home to the posts that are shared in the groups you've joined—including the groups your admin have set as Required. 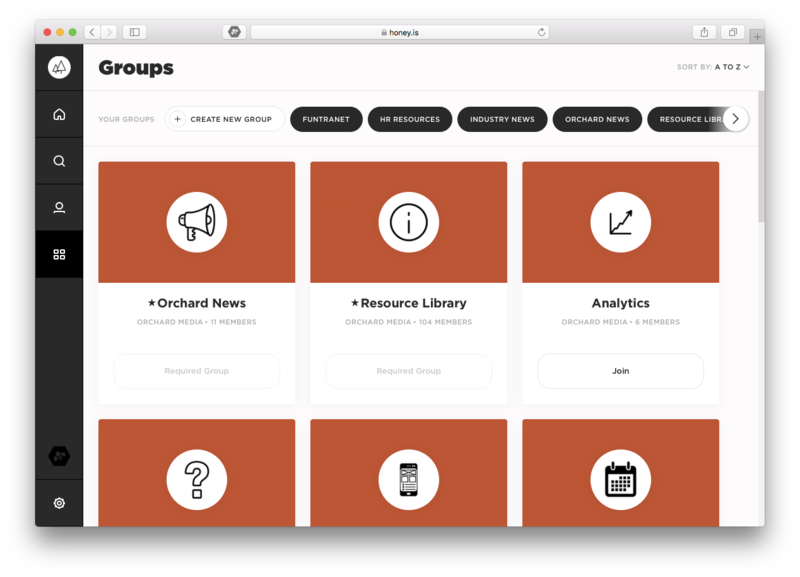 Your organization page, which you can visit by clicking your organization icon at the top of your lefthand navigation menu, is home to all of the posts shared across Honey. As you get more comfortable on Honey, you'll likely find that your feed is the best place to stay up to date with new posts from the groups you've joined, and eliminate the noise from groups that you haven't joined.